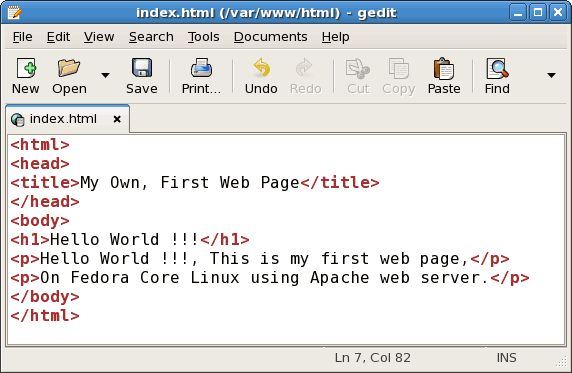 Step by step guide to create your own first web page on Fedora Core Linux Apache web server. 1. 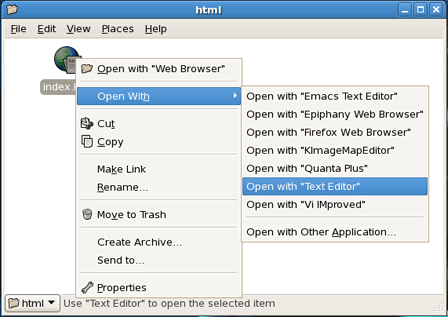 Open desktop x-terminal, then using the nautilus program go to the directory where you should put your web contents; Please note that the example show in this article use the /var/www/html/ directory as the web contents directory. 2. Point mouse pointer inside the html directory and right mouse click button, point to and click Create Document -> Empty File to create new empty text document inside the /var/www/html/ directory. 3. Click on the "new file" that you just create and rename the file to "index.html". 4. Right click mouse button on the index.html page and point the mouse pointer to Open With and choose the text editor that you want to use to edit the index.html page from the list. 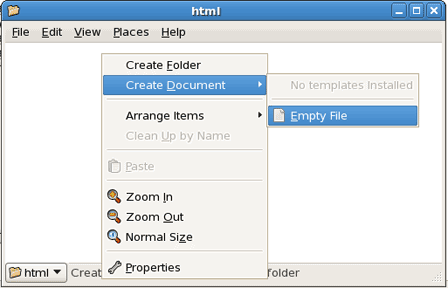 Note: The figure below show that the "text editor" (gedit) is the editor that use in this article. 5. Type in the "html code" as on example below or you can copy and paste the html code below or create your own html code using the text editor. Note: Make sure that you click the "Save" button after finish the editing process. 6. Open web browser and point the address field to your web server address or domain name (fqdn) and click Go button to start browsing. The example below show my first web page that I'm wrote earlier. Check the index.html page permission, make sure that the index.html readable by world (others). 1. 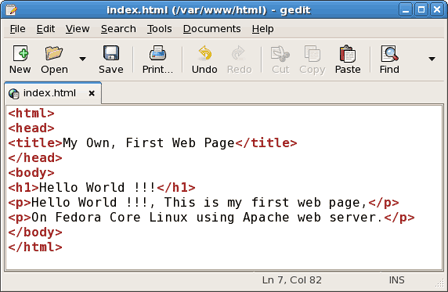 Using the Linux "ll" command to check the permission of the index.html, from the output of the "ll" command show that the index.html page not readable by world (others). 2. Change the permisson of index.html page using Linux "chmod" command to make the index.html readable by word (others). 3. Issue the "ll" command again to verify the changes. 2. PHP installation and information. Keywords: create web page, first web page, display web page, web page, html page, edit html code, html code, index.html, index page, first page, index.html, edit web page, edit page, edit html, forbidden page. Submitted by teryaks on Thu, 08/27/2009 - 03:29. Submitted by umask008 on Sat, 10/10/2009 - 21:31. Submitted by Glenn (not verified) on Fri, 10/19/2012 - 02:46. Tutorial works great worth the time to read. Submitted by Glenn (not verified) on Fri, 10/19/2012 - 02:47.
works great. worth the time to read.